Courtesy of Fox Searchlight, we’re giving viewers in Toronto, Vancouver, and Calgary the opportunity to win passes to an advance screening of BATTLE OF THE SEXES! For your chance to win passes simply fill out the form, listing your name email and which city you’d like passes for. 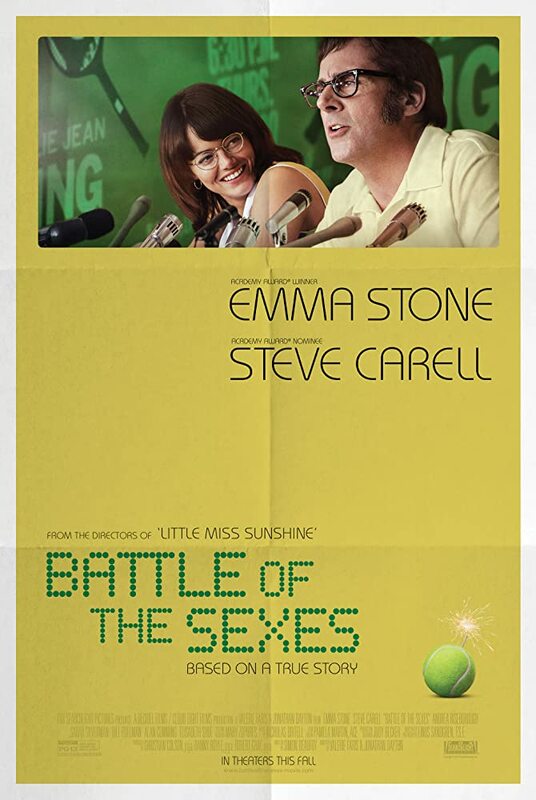 In the wake of the sexual revolution and the rise of the women’s movement, the 1973 tennis match between women’s world champion Billie Jean King (Emma Stone) and ex-men’s-champ and serial hustler Bobby Riggs (Steve Carell) was billed as the BATTLE OF THE SEXES and became one of the most watched televised sports events of all time, reaching 90 million viewers around the world. As the rivalry between King and Riggs kicked into high gear, offcourt each was fighting more personal and complex battles. The fiercely private King was not only championing for equality, but also struggling to come to terms with her own sexuality, as her friendship with Marilyn Barnett (Andrea Riseborough) developed. And Riggs, one of the first self-made media-age celebrities, wrestled with his gambling demons, at the expense of his family and wife Priscilla (Elisabeth Shue). Together, Billie and Bobby served up a cultural spectacle that resonated far beyond the tennis court, sparking discussions in bedrooms and boardrooms that continue to reverberate today. Battle of the Sexes opens in limited theatres on September 22, 2017 before expanding in early October.